.You step in through the south porch. As Mortlock points out, it feels a bit like entering a Victorian gothic church rather than a medieval one. The east window is magnificent. But if you had come here 250 years ago, you would have seen one of the most extraordinary memorials ever in an English village church. After the Reformation, and before the 19th century revival, chancels fell out of use. What was to be done with them? Some became vestries, or school rooms, or meeting rooms, or even storage areas. Here at Saxlingham, the chancel was filled with a massive monument to the wife of Sir Christopher Heydon, who died in 1597. A century earlier, his ancestor had rebuilt Salthouse church in an effort to negotiate purgatory on a raft of resulting intercessionary prayer; but protestant Sir Christopher could only ask to be remembered, and my goodness he set up an aide-memoire of gargantuan proportions. 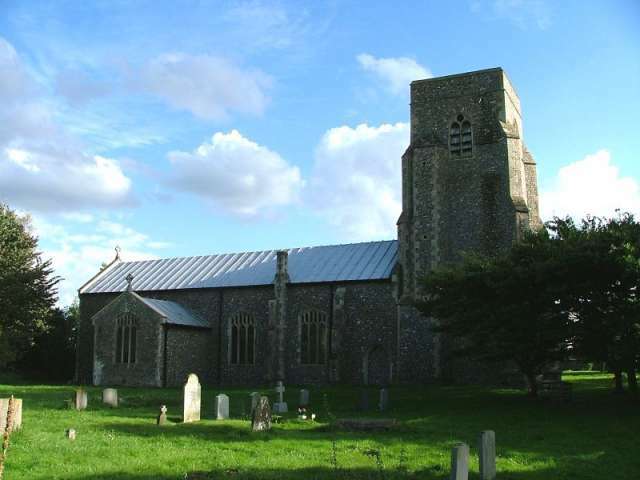 Blomefield, in his History of Norfolk described it as a sumptuous monument, which takes up almost the entire building, being raised in form of an Egyptian pyramid of marble and stone, supported by pillars, and reaching almost to the top of the chancel. The pyramid had a grand alcove in which knelt the alabaster Lady Mirabel, wife of Sir Christopher, and the whole piece was surrounded by lifesize effigies of their eight children, as well as four massive Doric pillars. All it seemed to miss was an eternal flame. It was destroyed in 1789 as being dangerous (Mortlock observes that this must have seemed a good excuse) and almost nothing of it survives. However, there are still a couple of fragments. In an image niche to the north of the chancel arch kneels the alabaster Lady Mirabel, looking slightly sheepish I thought. On the other side of the arch is her bible - curious, the text inscribed on it is from a pre-Authorised version of the Bible. I love the old man whose head forms a medieval corbel beside it. I wonder if it was the monument that made him so cross. Martlock notes one surviving echo of Sir Alfred Jodrell's Anglo-catholic enthusiasms. The organ here comes originally from St Barnabas, Kentish Town, that great North London High Church shrine.